When you hear or read "satellite television," you naturally think of a service like Dish Network or DirecTV. When encountered in a 1956 Radio & TV News article, you know "satellite" must mean "(3) someone or something attendant, subordinate, or dependent." 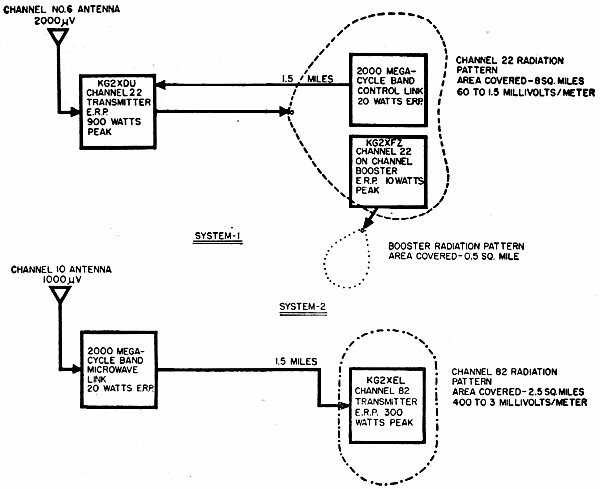 Such was the case for satellite TV locations in areas where, without a network of microwave relay towers, communities situated where geography (i.e., mountains) inhibited standard VHF and UHF broadcast signals from reaching sets with sufficient power were left with no or frustratingly poor reception. Home-based satellite TV as we know it today began in the mid 1970s with Pat Robertson's Christian Broadcasting Network broadcast. Artifacts of that ancient time can still be spotted in rural areas: 10-foot-diameter dishes with eyeballs, smiley faces, or camouflage patterns painted on them. Although not mentioned in the article, my guess is that a lot of people objected to the "eyesore" created by all the tall microwave towers beginning to dot the countryside. Compare that to the horrendous cluttering of nearly every vista today with cellphone towers and power generation wind turbines - yuk. 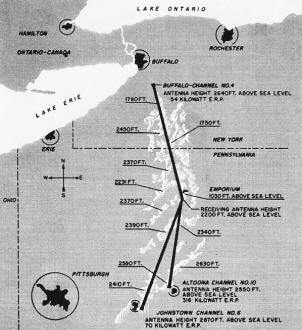 A map of the coast-to-coast microwave network in the U.S. appeared in the May 1952 Radio & Television News - four years before this story. Fig. 1 - Emporium, PA, where the satellite stations described in this article are located, is a small town situated in a valley blocked from surrounding v.h.f. TV stations by relatively low mountains. Direct station signals are unavailable. Various types of booster and satellite TV transmitters are under consideration for improving u.h.f and v.h.f. TV reception. Here are experimental results from three. How can a small town situated in one of the narrow valleys of Northwestern Pennsylvania, 65 miles from the nearest commercial television station, have the highest concentration of television receivers of any community in the United States? Satellite television is the reason. In 1951 Sylvania Electric Products Inc. obtained a license for an experimental u.h.f. TV station to provide an "off-the-air" test signal for field testing u.h.f. tuner tubes and equipment then under development. Another objective was to investigate the feasibility of unattended satellite operation as a means of economically supplying TV coverage to remote areas not receiving signals from established stations. Emporium, Pennsylvania, is in just such a remote area. The town is situated deep in a valley in the Allegheny Mountains at an elevation of about 1050 feet above sea level. The surrounding hills rise sharply, 1000 feet or more above the valley. While television signals are received sporadically in the valley, consistent reception from several television stations is possible on the hilltops. Fig. 1 shows the location of Emporium relative to cities with v.h.f. television stations. 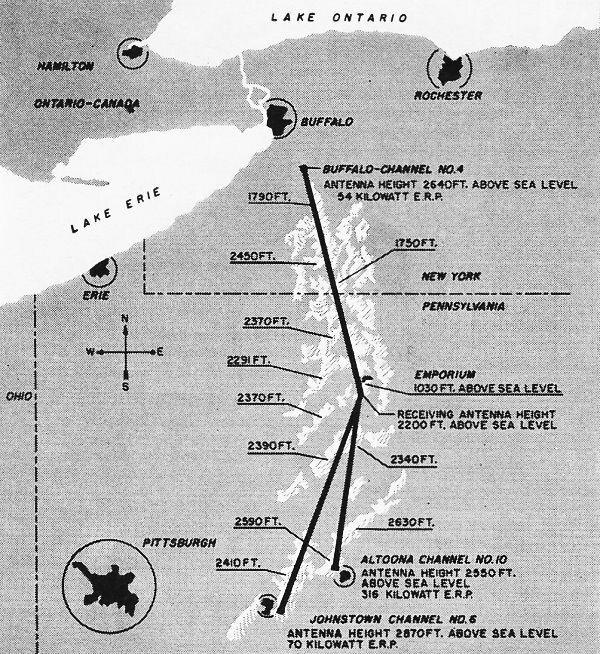 The original transmitter site was chosen to fulfill three objectives: provide line-of-sight reception at the Sylvania plant and most of Emporium; provide acceptable reception of available v.h.f. signals; and be readily accessible by road. The site selected was 1100 feet above and 1.7 miles southwest of the center of Emporium. Fig. 2 shows the tower site in the foreground located on top of a hill overlooking the town. There are now two experimental u.h.f. television systems in operation in Emporium as shown in Fig. 3. In system 1, the channel 6 v.h.f. signal is picked up from the Johnstown station 88 miles distant, demodulated, and retransmitted on u.h.f. channel 22. Because one area of the town is shadowed from the u.h.f. transmitter by an intervening hill, the signal from the u.h.f. transmitter on the hill is picked up in the valley, amplified" and re-radiated on the same channel to provide coverage in this shadowed area. In system 2, the v.h.f. television signal is received at the hilltop location, relayed by microwave to a central location in the valley, demodulated, and rebroadcast on channel 82. Fig. 2 - View of Emporium, PA, from the air. The u.h.f. satellite TV transmitter antenna site is in the clearing in the foreground, on a mountain south of town. Fig. 3 - Block diagram of two different experimental satellites as described in text. All transmitters operate automatically and are unattended. The stations are monitored at all times and in the event of any malfunction of equipment, the stations are turned off until corrective measures have been taken. The channel 22 station on the hill is remotely controlled by microwave control equipment. One of the hilltop towers is shown in Fig. 4. The main tower is 98 feet in height. Mounted on it are the channel 6 ·receiving antenna, the transmitting collinear arrays for channel 22, and microwave transmitting and receiving antennas. Another mast, not shown, supports channel 4 and channel 10 ten-element yagi antennas. The top of this 65-foot mast is only a few feet above the trees bordering the clearing. A concrete block building houses receivers, transmitters, and associated equipment. Because of the isolated location, there are no windows in the building. The necessary ventilation is supplied by air vents and exhaust fans. Fig. 5 is a photograph of the transmitting equipment. The pattern generator with custom-built monoscope tube for station identification is in the rack on the left. The sync and timing generators for the monoscope are mounted in the next rack. Since the photo was taken, microwave receiving and control equipment has also been installed. Power supplies for the microwave transmitter are on top of this same rack. The center rack houses the channel 22 sound transmitter. The picture transmitter is in the rack beside it. The rack on the right contains monitoring equipment. The tape recorder used for automatic aural station identification can be seen on top of the rack on the right. The transmitters are turned on and off by two clocks, one for weekday operation and another for weekends. Other time clocks control the receiver and insert visual and aural station identification at regular intervals. A running-time meter on the equipment has recorded over 20,000 hours of operation. As previously mentioned, one section of Emporium is shadowed from the hilltop transmitter by intervening hills. An on-channel booster station was constructed to redirect the signal into this shadowed area and, at the same time, provide additional technical data on the problems associated with this type of transmission. Isolation of the receiving and transmitting antennas was the first problem encountered. Unless the two antennas are properly separated and oriented, the amplified signal from the transmitter will again be received at the receiving antenna resulting in feedback. 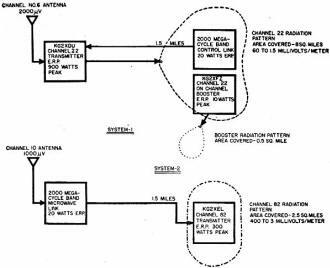 Placing the directional antennas about 75 feet apart and directing them at right angles to each other gave an isolation of about 93 dB between them. The received signal is, of course, horizontally polarized but it is re-radiated with vertical polarization. The cross polarization gave very little added isolation between transmitting and receiving arrays; however, use of cross polarization permits a viewer to choose between reception from primary station or booster station to eliminate ghosts. With horizontal polarization of both signals severe ghosts were a problem in the areas where signals from both primary and booster stations were of equal intensity. Vertical polarization of the retransmitted signal corrected this difficulty. The transmitter of the on-channel booster station consists of several stages of 6AN4 tubes operated grounded-grid and stagger-tuned to give the required 6 mc. bandwidth. The output stage uses a pair of 5876 tubes in a grounded-grid, push-pull circuit. Voltage gain of the amplifier or booster is about 68 db. Fig. 4 - (Left) Close-up view of tower and building located at the hilltop site. Fig. 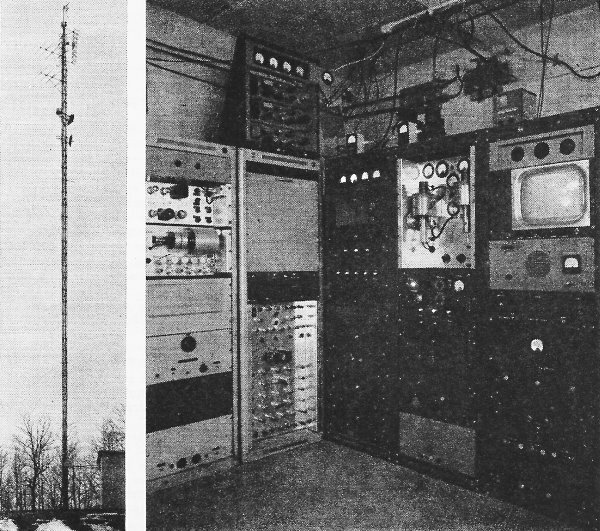 5 - (Right) Transmitting equipment for the channel 22 satellite transmitter, KG2XDU, and microwave and transmitting equipment contained in the hilltop building. Shown here are monoscope pattern, sync, timing generators, and transmitters. The on-channel booster has been operated more than 6000 hours. Color programs have been received over it with no apparent degradation of the signal, so cross modulation has not been a problem. The use of a booster transmitter to supply a TV signal to a shadowed area has been quite successful. To obtain a signal from KG2XDU in the area equivalent to that received from the booster KG2XFZ, would require raising the transmitter average power by 16 times. This is 1000 times the power of the booster transmitter and illustrates the saving which can be obtained by the use of low-powered boosters to cover small shadowed areas. Will the best television signal coverage of an urban area be obtained by locating the transmitter on a hill overlooking the area and using a directional antenna, or by installing the transmitter in the center of the area and employing an omni-directional antenna system? To answer this question and to compare tube performance at the high frequency end of the u.h.f. 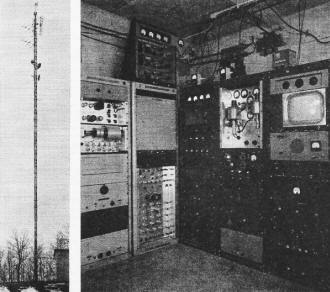 TV band, a channel 82 transmitter was constructed and put in operation in the valley near the center of Emporium. Except for an additional doubler stage between triplers and final amplifiers, and the use of the tube type 4X150G in the power amplifier stages, the channel 82 transmitters (sound and picture) have the same tube line-up as the channel 22 transmitters. Program material is relayed from the hilltop location to the satellite transmitter in the valley by a microwave link operated in the 2000 mc. band. Both sound and picture are microwaved, the FM sound being transmitted on a 6 mc. subcarrier. The tower in the valley which supports the channel 82 transmitting array, the on-channel booster corner-reflector transmitting antenna, and the two microwave antennas with associated equipment, is pictured in Fig. 6. The channel 82 transmitting antenna is designed to radiate an elliptical pattern to conform to the shape of the valley. Although the measured signal strength from KG2XEL on channel 82 is as great or greater than that from KG2XDU, channel 22, reception generally is not as good. The higher frequency of transmission, which makes the shadowing effect of trees and buildings much more pronounced, and the lower antenna height - the transmitting antenna is only 70 feet above ground level - coupled with the generally poorer performance of u.h.f. tuners and converters at the high frequency, limit the channel 82 coverage much more than was anticipated. Reflected signals seem to be more bothersome at channel 82 than at the lower channel as well. Fig. 6 - Tower and transmitting antenna for channel 82 satellite located in town of Emporium, PA. The channel 22 booster corner reflector antennas and parabolic antennas for microwave links are also shown. The Federal Communications Commission has recognized the need to extend television coverage to communities too distant to receive signals from established stations and too small to support a television station. 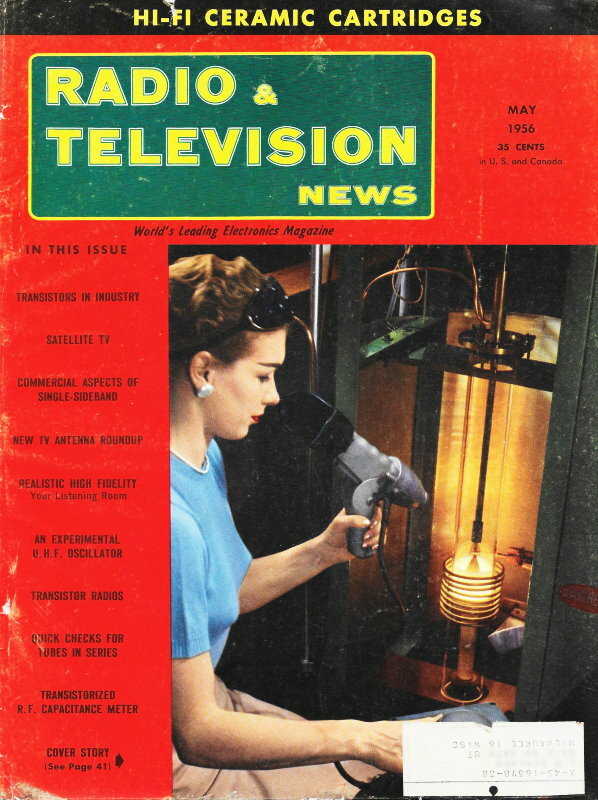 On August 1, 1955, the FCC reduced the minimum power requirements of commercial TV stations to 100 watts at any antenna height. Public Notice FCC 54991 of August 5, 1954, invited applications for stations which do not propose to originate local programs. These rule changes are the first step in the Commission's efforts to provide each community with at least one television station. As a result of Public Notice 54991 several stations are now being operated as satellite stations, rebroadcasting programs received by off-the-air pickup from other TV stations. Technical operating requirements of these stations, however, are the same as regular commercial TV stations except for the programming. Two TV stations thus operated are KTRE-TV in Lufkin, Texas, rebroadcasting programs from KPRC-TV, Houston, 125 miles away; and KDLO-TV, Florence, South Dakota, rebroadcasting programs from station KELO-TV, Sioux Falls, South Dakota, 100 miles distant. Probably the best example of low-power television stations in operation at v.h.f. is afforded by the Armed Forces Television Service which operates five low-power (less than 100 watts e.r.p.) stations at isolated military bases. It is too early to see what effect the reduction of minimum power requirements will have on the establishment of commercial TV stations in the smaller communities. It is difficult to predict whether or not the financial advantage gained by lower first cost will be great enough to compensate for the lower income obtainable in a small community. Further relaxation of the present rules is required to stimulate the growth of a commercial low-power satellite service. A committee of the RETMA has studied the problem extensively and made recommendations. These recommendations and comments from other interested parties are now being studied by the FCC. A comparison of unattended satellite stations and community antenna systems as a means of providing a TV signal to a small remote community is presented in Table 1. Advantages and disadvantages are listed - some are of more concern to the viewer, others are applicable to the operators of the systems. Because relaxed rules applicable to commercial unattended satellite stations have not yet been adopted by the FCC, little station equipment is available commercially. It has been estimated by the manufacturers of related equipment, that such a station should be obtainable in the future for from $10,000 to $50,000. 1. No cost to the viewer. 2. Most economical way to provide servo ice to a number of viewers. 3. Provides service to isolated viewers living out of the urban area. 4. Does not interfere with the signals of the originating station. 5. All the equipment is in one spot for easy maintenance. 6. Viewer requires only a simple antenna. 7. Offers opportunity to grow into a full fledged station with locally originated programs. 1. A satellite station can only broadcast one program signal at a time. as is the case for regular TV stations. 2. Requires an FCC license, and rules for commercial operation of unattended satellites have not yet been provided. 3. Expenses must be defrayed by popular subscription, or advertising. 4. Requires some frequency spectrum space but this is available in the u.h.f. band. 1. Several programs may be provided. 2. Requires no FCC authorization, but will have to meet FCC signal radiation limits in the future. 3. Provides a captive audience which may be billed monthly to defray the expense of the operation. 4. Requires no frequency spectrum space, if radiation is suitably controlled. 5. Electronic equipment required is not complex. 6. Viewer requires no antenna installation. 1. Requires an extensive cable distribution system, with attendant local franchise and utility pole rental contracts. 2. May interfere with the signals of the originating stations. if radiation is not carefully controlled. 3. Electronic equipment is scattered throughout the system, complicating maintenance. Unlikely to grow into a local TV station with locally originated programs. However, some do or intend to oriqinate local programs.